How Big Are the 'Next Big Things' in Tech? This chart shows a forecast of emerging technology sales in the United States. Over the past few years, many things have been touted as "the next big thing" in the tech industry. Be it smartwatches, virtual reality headsets or smart home devices -- what they all have in common is the fact that they haven't made an impact the way that smartphones did when they first came around a decade ago. That doesn't mean that some of these technologies aren't popular however. So how big exactly are these next big things today? And which one is maybe closest to becoming as ubiquitous as smartphones have become? 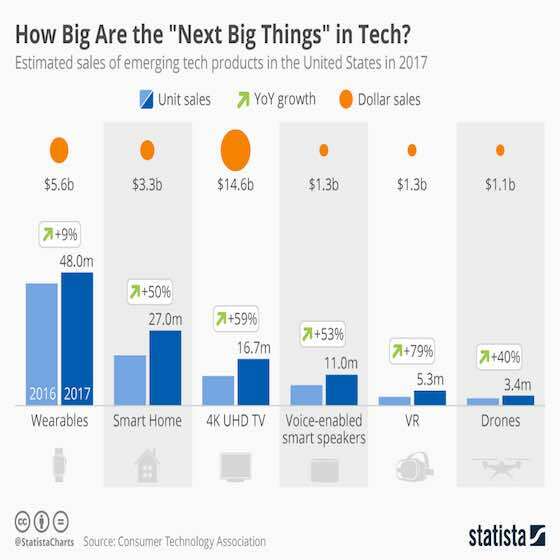 The chart above, based on a recent forecast published by the Consumer Technology Association, shows that wearables, smart home devices and 4K TVs have already become multi-billion dollar sellers in the United States while drones and VR headsets are still in the earlier stages of the adoption curve. Personal Tech & Gadgets "How Big Are the 'Next Big Things' in Tech?"